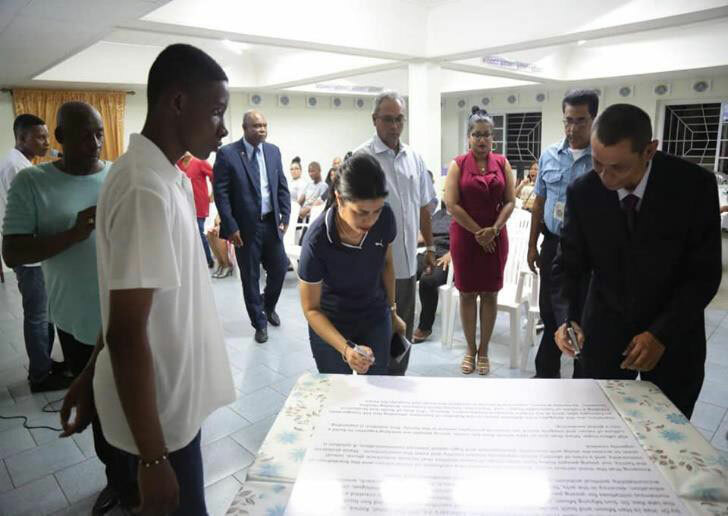 On February 16, 2019, Suriname had the inauguration of Youth and Students for Peace (YSP) at the Family Federation for World Peace and Unification (FFWPU) headquarters building. The theme of for the event was “The role of youth and students in establishing a culture of sustainable peace”. Our guests and participants included the Minister of Sport and Youth Affairs, Ms. Lalinie Gopal and her Protocol team, Vice Chairman of the 2nd largest political party in Suriname VHP, Dr. Glenn Oelhers, a representative of the Minister of Social Affairs and Public Housing, Mr. James Wills, religious leaders, Ambassadors for Peace, 16 youth (including a youth leader from the 2nd biggest political party in Suriname, 3 university students, 1 high school student, 3 secondary modern school students and others), families and Blessed Families. 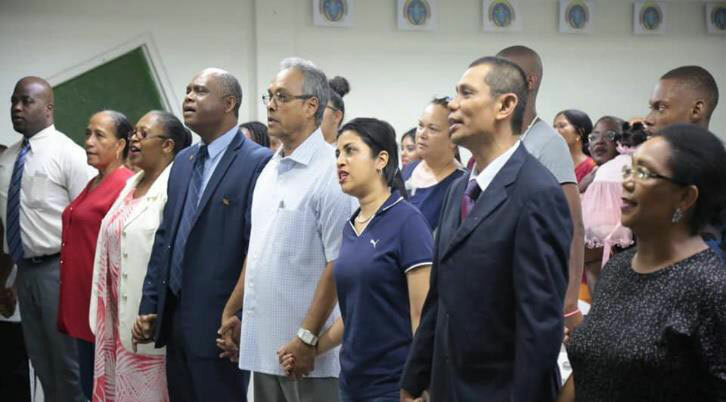 After the presentation of the YSP video, the National Leader of FFWPU Suriname, Mr. Roel Rotgans gave the keynote address saying “YSP is the youth branch of FFWPU and was founded by the late Reverend Dr. Sun Myung Moon and his wife, Mother Hak Ja Han Moon. Since her husbands’ passing in 2012, she worked for 7 years to substantialize the ideals and goals that both she and her husband have striven to achieve all their life. From the autobiography of Father Moon, chapter 8, ‘A new vision for the youth”; ‘Find your purpose, change your life’: “God is interested in every person, especially young people and when He gets to know them, it gives Him great joy. This is because our youth is the most important and nicest time of our life. Because God exists, we can achieve anything. Young people must choose to use their talents to aid the world, instead of making a career for themselves”. If we want a better world, we should start in the family, because it is the central point in all cultures. Something went wrong in the first human family and that was sexual immorality. If we want to solve all humankind’s problems, we have to go back to God. Either we stay in sexual immorality or we cut off, repent to God and make a pledge to never hurt Him again. That is why we encourage young people to maintain their sexual purity until they are married. Your attitude will influence or determine everything that happens in this world. YSP’s goal is to restore and create the ideal of God through being pure and honest citizens”. Next, a presentation of the activities that will be conducted by YSP in Suriname, was presented by the Secretary General of YSP Suriname, Ms. Silma Rotgans. She introduced Rev. Sun Myung Moon and Dr. Hak Ja Han Moon as the founders of YSP and that their vision of one family under God is also the vision that YSP strives to achieve. The term HyoJeong was explained and the 3 levels on which the activities will be carried out. These are: character education, service-learning projects and intercultural activities. Lastly, it was mentioned that the YSP also focuses on helping to solve the 17 SDG’s created by the UN. Mr. O’Niel Kasanoemar was appointed as the President of YSP by the National Leader of FFWPU Suriname, the Minister of Sport and Youth Affairs and the Vice Chairman of the 2nd largest political party in Suriname VHP and gave his acceptance speech. He said “You have learned a new Korean term today, HyoJeong, which means ‘filial piety’. It’s not only to obey your parents, because without them you would not exist. YSP wants to bring HyoJeong into the society. This education has to start from the elementary school level. HyoJeong means to show respect and love to others continuously and ask for nothing in return. That is the basis for peace and happiness. Peace begins with me and so also in the family. This is because I am part of the family. Furthermore, it is the love between brothers and sisters. YSP strives to achieve sustainable peace through living for the sake of others. I thank you all for coming and hope you will join us in achieving these goals together. One of the activities of YSP is Pure Love education and there we find the Pure Love Pledge, which encourages the youth to keep their sexual purity till marriage”. It was followed by the congratulatory remarks by the Minister of Sport and Youth Affairs, Ms. Lalinie Gopal and the Vice Chairman of the 2nd largest political party in Suriname VHP, Dr. Glenn Oelhers. The Minister said “I am honored to be part of this event. 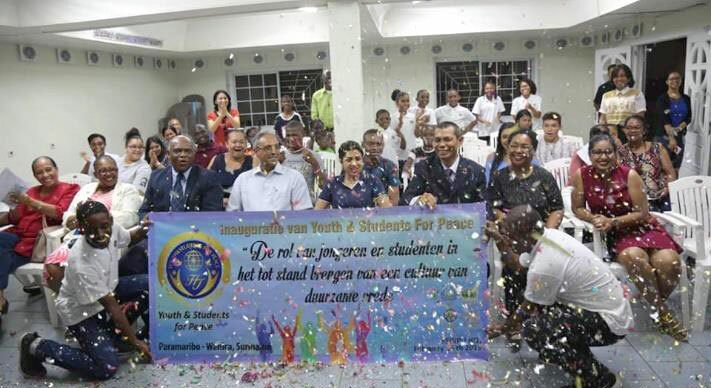 YSP is the youth branch of FFWPU in Suriname. I would like to congratulate YSP on behalf of the Ministry of Sport and Youth Affairs. It is a milestone for the organization as well as for the Surinamese community. YSP Suriname stands for character education, service learning and the bringing together of cultures. This is so that youth don’t forget about their responsibility towards God, mankind and the environment. Just like YSP, the Ministry of Sport and Youth Affairs believes that the youth can be the future leaders. With their attention to God, they can grow up to become good citizens, moving on to a public mindset of individuals and it keeps influencing every level in human life. It works to achieve peace on every level of society. Whether private or business, we don’t see each other just as people, but as brothers and sisters. Words of Confucius: ‘The more people meditate on goodness, the better the world as a whole will be’. 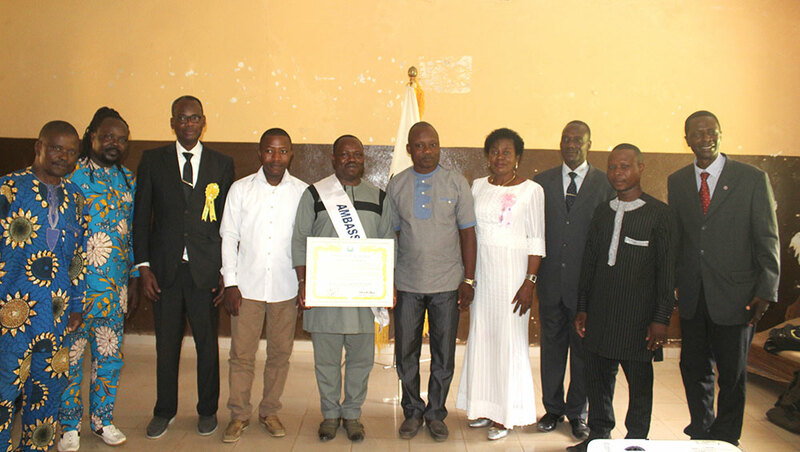 It was followed by the signing of the resolution by all attendants, entertainment by the 2nd generation group and other guests, a commemorative picture and lastly tall attendants joined hands and sang the song “One Family Under God” together. It was followed by more entertainment and the sharing of snacks and drinks. The event was an eye-opener to all people present and they have shown a lot of interest in the activities of YSP as well as the Blessing. We believe that YSP can turn the tide of the nation to fulfill national restoration.